Hockley was founded in 1914 as a 9 hole course and given as a silver wedding anniversary gift from Twyford Down land owner Horace Trimmer to his wife Bessie, a keen golfer. Various First World War military units were stationed in Winchester and officers were invited to become Honorary Members at ‘The Hockley’ by Bessie Trimmer. To this day, members still compete for 'The Tank Cup' - a Challenge Cup donated by the Tank Corps Battalion. To meet the increased demand for golf, new holes were added between 1918 and 1920 making Hockley an 18 hole course. 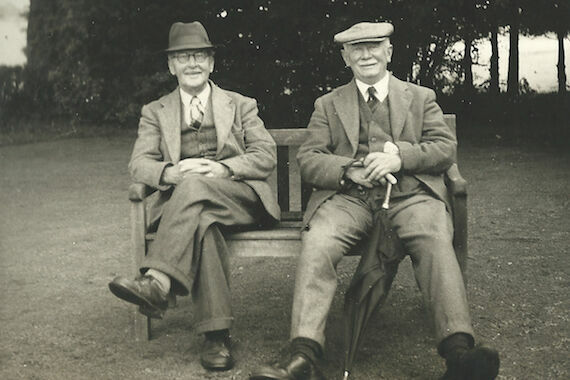 In 1920, the course was re-modelled and lengthened by the five time Open Champion and course designer James Braid. When Horace Trimmer died and his estate was put up for auction there was a very real possibility that Hockley would be sold to housing developers. Fortunately it was ‘rescued’ by two Winchester College dons and Hockley members, who had the means to outbid the developers. Maurice Platnauer became the Club Captain and Murray Hicks took control of the club’s running. Strong links were forged with the College and in 1955 Platnauer and Hicks gifted the property to Winchester College, who remain the club’s landlord to this day. The images on the above show some of the winning teams from Hockley dating back to the 1970's. There is also an image of the Club car park from the late 1960's. In more recent years the Club has won the Hampshire County 7's trophy (2008), and were losing finalists in 2013. The Ladies Team has also won the prestigious 'The Mail on Sunday National Classic' on three occasions. Of the many great characters associated with Hockley, special mention should be made of AP Sharpe, or ‘Sonny’ as he was known. Sonny was a +1 handicap golfer, who dominated the Club Championship over 5 decades, winning it a record 17 times. He was also Hampshire Amateur Champion in 1932 and 1949. Hockley has celebrated its Centenary in 2014 with a number of special events, together with the opening of a new Professional Shop and an extension to the Clubhouse which provides a private dining facility for Societies and Members. It is confidently looking forward to the start of its next 100 years.